I used to joke about Mickey having OCD (obsessive-compulsive disorder) because he had OcD (Osteochondritis Dissecans) in his ankle a few years ago. But the truth is is that I'm the one with a little OCD. And by a little I mean it's not a repetitive thing or a strong desire. There are things that I have to fix or they bug me. Lately, and I had to fix it today, it's been the light switches. 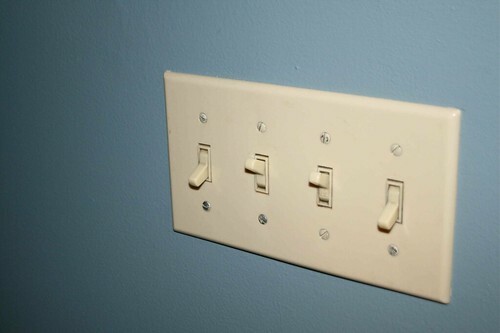 You see in this house there are multiple switches that control the same light(s). And I don't like to see the switches looking like this, unless one or two lights are on. So I had to go to three different locations to fix these switches so all go in the same direction. I know, I'm a little nuts. I'm sure I'm not the only one out there that would be bugged by this.